Flanked by Carbis Bay to the west and Hayle Towans to the east, the less accessible Porthkidney Sands remains crowd-free even in the height of summer. Boasting a mile of empty, dune-backed sands (that’s actually quite easy to reach from Lelant), it’s often the domain of just a handful of surfers and smug dog walkers. Dubbed ‘Happy Dog Beach’ by the locals, it’s just two miles along the South West Coast Path from the hub of St Ives. It’s no surprise that surfers and families flock to Porthtowan, what with its smile of sand pummelled by Atlantic breakers and the convenience of beachside parking, cafés and surf shops. However, you don’t have to forego beachside parking to enjoy its wilder, more remote neighbour, Chapel Porth, with its sugary sands, sea caves and staggering cliffs atop which dramatic engine houses peer out to sea. Part of the magic of this shingle and sand beach on the banks of the Helford is getting to it through Glendurgan Garden. Once you’ve bashed through bamboo groves, got lost in the cherry laurel maze and been dwarfed by giant Gunnera plants, it’s hard to believe your eyes when you eventually emerge on the shores of a charming beach that’s perfect for skimming stones and building sandcastles. With white sands and iridescent-blue seas backed by towering cliffs and the famous Logan Rock, this paradise cove has many reasons for keeping the crowds at bay: Firstly it’s a low-tide beach and, except on a spring tide when you can walk from neighbouring Porthcurno, it’s accessible only via knee-wobbling cliff path. And secondly it’s, unofficially, a naturist beach. 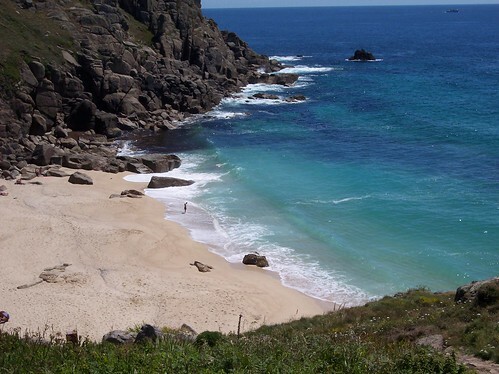 Stroll east along the beach from Sennen Cove and eventually you’ll set foot on the more rugged, more secluded Gwenver, where serious beach lovers sprawl on sugar-white sands, scramble over wave-hewn boulders and dip in unforgiving waves. Fortunately, unless you’ve strayed from Sennen on a low tide, the steep cliff staircase is a good deterrent for anyone not utterly serious about beach life. At the foot on the Coombe Valley – north of Bude’s busier beaches – awaits a wilder, more desolate coastline where Jurassic-looking ridges yawn towards the border of Devon. And it is here that you will discover the rugged little treasure of Duckpool, where vast cliffs collapse into a sand and boulder beach and there are no tourist trappings except for an ice cream van on the sunniest days. A good ten-minute stroll from any parking and with no beachside amenities to spoil its beauty, Vault Beach attracts naturists and sea swimmers looking for some peace and quiet. Sheltered by Dodman Point on Cornwall’s south coast, here the fine shingle shelves into piercing blue waters that are usually calm and hospitable to all levels of swimmers. Sandwiched between Praa Sands and Marazion, the sheltered cove of Perranuthnoe bags all the beauty of its neighbours, without inviting the crowds to enjoy it. From the cliffs you can gaze out to the magical sight of St Michael’s Mount, whilst the beach itself boasts the same excellent swimming and surf conditions as nearby Praa. 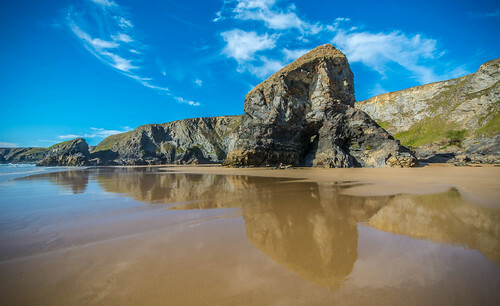 With its mussel-clad towers of granite rising from the sand, Bedruthan Steps attracts plenty of camera-swinging visitors to snap its beauty from the cliff tops. However, many are deterred from the beach by the 140-odd steps to reach it, so you can enjoy the gob-smacking scenery from crowd-free pearly sands punctuated by rockpools teeming with marine life. Discover all of Cornwall’s secret coves when you stay in one of Carbis Bays Holidays’ luxury cottages. We’ve got a huge range of family holiday homes, boutique boltholes and stylish self-catering properties around St Ives and Carbis Bay. Win a VIP family visit to the Cornwall Air Ambulance base and meet the crew.